It’s never been considered one of the more glamorous jobs in hockey, but nonetheless on-ice officials are as passionate as they come about their trade. Locally, Ron Groothedde, the Colorado Amateur Hockey Association’s (CAHA) supervisor of officials, sees to it. He represents the state’s 800-plus zebras, managing their annual education and certification requirements while constantly pushing USA Hockey’s practices and procedures to all the independent referee associations across the state. “Collectively, our goal is to allow every official reach whatever their desired potential may be, and produce some amazing ones who make a huge impact on the game locally, nationally and even internationally,” said Groothedde. A Winnipeg native who resides in Golden, Groothedde likes the direction officiating statewide is heading, despite the drop in participation of about 100 officials since he took the job four years ago. Retention anywhere, he says, will always be an uphill battle. When it comes to grooming the best officials possible, Groothedde says the development process is very much in the hands of the independent associations. After proper certification by USA Hockey on a yearly basis, each official is placed at the appropriate level and continually train, develop and advance their skills under each association’s watch. “Ideally, all officials are evaluated on a regular basis, with kudos being given for the things they do well, advice on improvements they can make and the occasional ‘what-were-you-thinking, don’t-do-that-again’ moment. 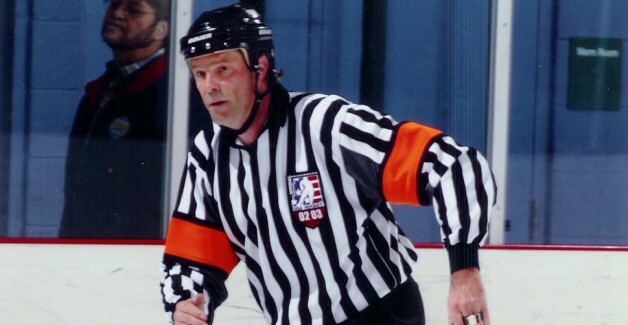 “Rest assured, though, that both USA Hockey and CAHA are continually striving to put the highest quality officials on the ice at all times,” said Groothedde. The overwhelming majority of officials are former players looking for another avenue to stay involved. For the younger kids ranging from 13-18 years old, many still play but discover a whole new appreciation for the game – as well as a great part-time job – with a whistle in their hand. “The only true difficulty to overcome (in becoming an official) is that you have to be the best skater on the ice,” Groothedde. “The game is fast, and our perception of events and decision-making processes have to be equally fast, and our communication skills with players and coaches have to be above reproach. Colorado has churned out its fair share of top-flight officials, among them linesman Jon Grandt, from Denver, and referee Tom Chmielewski, a Colorado Springs native – both of whom have reached the NHL in the last two years. A good number are also calling games at the junior, college and minor-pro levels. In the end, Groothedde’s love of officiating is an avenue to stay connected to the sport. “It’s about giving back to the game, meeting an amazing group of dedicated, highly-skilled fellow officials and having the best seat in the house watching the greatest game there is,” he said.